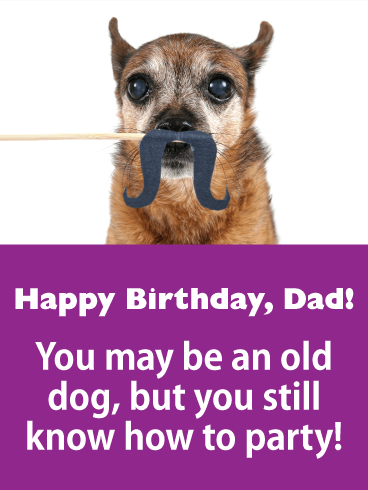 He may be an old dog, but your dad's still got plenty of bark left in him...especially on his birthday! This year, put him in the mood for a party with this fun, canine-themed card that's sure to have him howling with laughter. Your dad's idea of fun may not be what it used to, but at his age, he's earned the right to do whatever it is he wants on his birthday...even if that means sitting around with the remote in hand and a big bowl of popcorn in his lap! 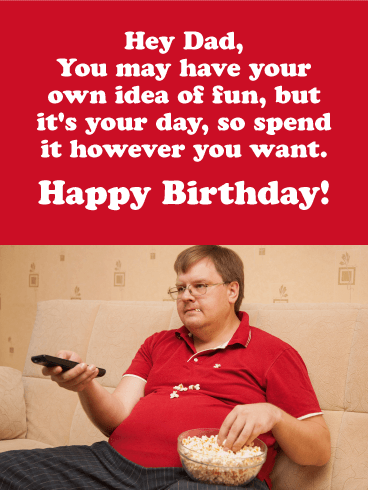 This funny birthday card is a laugh-out-loud way to remind -him that you don't care how he spends his time celebrating, as long as he has a good time doing it. He may not be able to fly and his x-ray vision is non-existent. 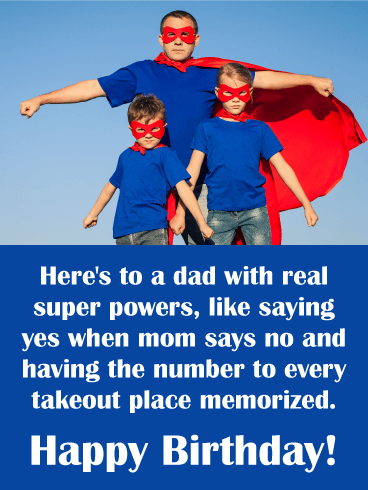 But to you, he's a super dad in every way because of those everyday things he does! This year, let him know with this playful birthday card for your favorite caped crusader of serving ice cream for dinner and watching an entire day's worth of sports on TV without getting up once! He's guaranteed to be beaming, knowing you took the time to celebrate him on his big day. 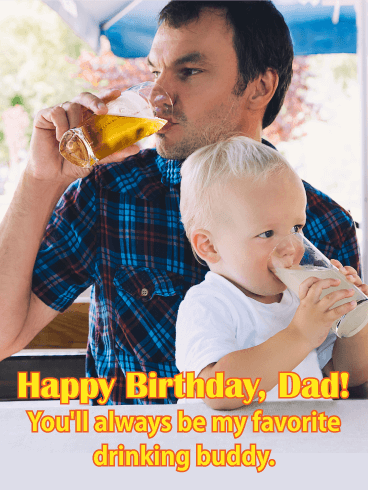 of father and son sharing their own drink of choice together, it's a fun way to make him laugh while raising a toast to him as he celebrates his special day. 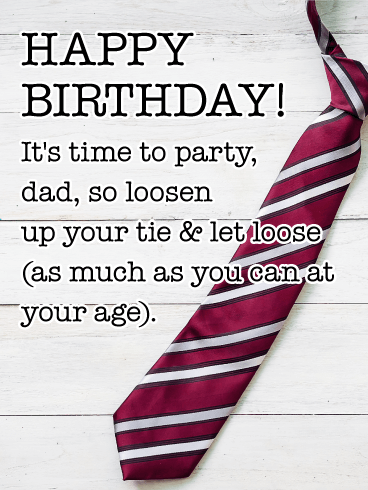 For the dad who spends hours in the office working hard, this funny birthday card is a reminder for him on his birthday to loosen the tie and let loose...as much as he's capable of at his advanced age! 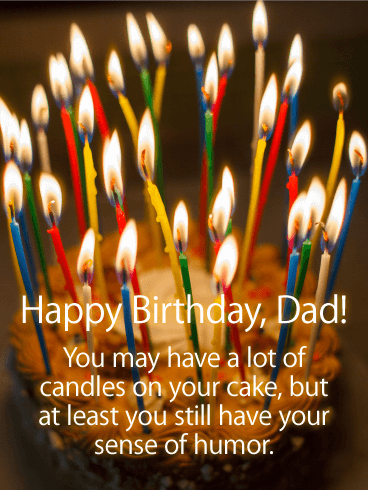 With lots of humor and a whole lot of heart, this funny birthday card is sure to give him a chuckle as well as a reason to stop and celebrate another year of being the awesome dad he is. Wouldn't dad love a brand new sports car waiting for him in the driveway on his birthday? It's an incredibly generous gift that you would totally get for him if you had the money, but until then he'll have to settle for this hysterical card instead! 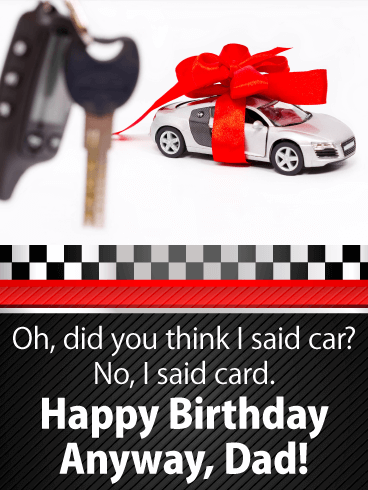 This funny greeting is a great way to remind him that it's the thought that counts (even if he'll still be dreaming about getting that car next year)! 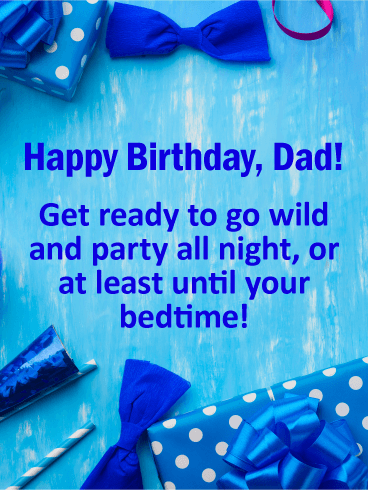 It's your dad's birthday, which calls for a non-stop celebration, or at least one that goes until his bedtime! Simple but so funny, this card is a classic when it comes to making dad smile, and has all the elements of the perfect party, however time it may be. A great choice for anyone with a dad who doesn't take himself too seriously and enjoys a good laugh (even if it's at his expense)! Simply put, your dad is still bad to the bone, no matter how old he's turning this year. 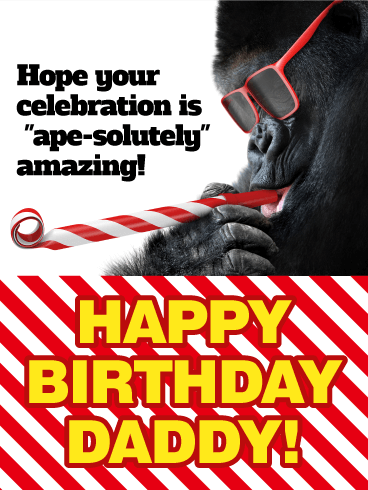 So send a fun birthday card to let him know! 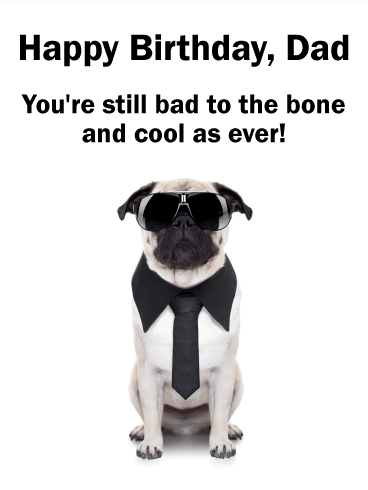 A cool canine, complete with shades and a tie, is ready to help you wish your totally rad dad an awesome celebration with plenty of playfulness and humor. Got a dad whose game could use some work? That's ok, because it's his birthday, and after a few cocktails, he'll forget all about it! 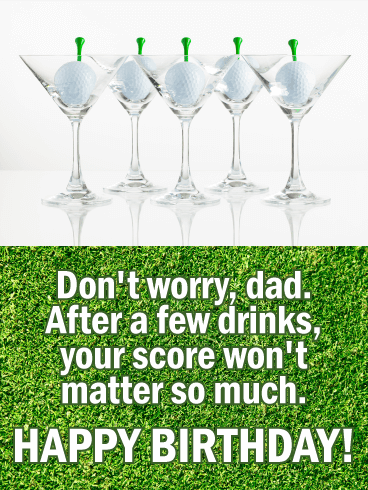 This funny birthday card is the perfect pick for getting lots of laughs from dear old dad. Even if he's not a golf lover, he'll appreciate your smile-inducing sentiments as he celebrates his special day. Uh-oh, better get the fire extinguisher ready for this cake! Here's the perfect birthday card to remind dad how old he's getting in hysterical fashion. He's sure to get a kick out of all those candles, especially if he's got a good sense of humor. Either way, it's sure to light up his big day in the best way possible! Just look at that adorable gorilla. The sunglasses? Absolutely precious! The noisemaker? Hilarious! And just look at the expression on his face! This birthday card has just enough personalization to make it unique, but it's suitable for a wide range of fathers. With a color scheme reminiscent of candy canes, this is also a perfect birthday card choice for a dad with a winter birthday.